Dance was the resplendent art form in ancient Tamil Country. Dancing played an indispensable role in the lives of the ancient Tamil Sangam society. In ancient times the dance was known as Koothu (கூத்து). Later the dancing transformed into “Chadir attam” (சதிர் ஆட்டம்) which means “court dance” and was danced in the temples of South India by the Devadasis (தேவதாசி). Bharatanatyam (பரதநாட்டியம்), the classical dance form of Tamil Nadu, derived from its older form i.e., Chadir attam. Bharatanatyam is primarily concerned with the grammar of Natyashastra (நாட்டியசாஸ்திரா), an ancient treatise on dance and drama compiled by sage Bharata Muni (பரத முனி). The corpus of literature written during Tamil Sangam period spanning from 300 BC to 300 AD was known as Sangam literature. Poetry, music and dancing were popular among the people of the Sangam age. Scores of musical instruments are cited and scores of ornaments are also mentioned in the Sangam literature. The oldest proof of existence of dancing comes from the 5000 year old rare rock murals that were discovered in Tirumayam fort, Tamil Nadu. Till recently nothing was known about the rock murals. However an exploration made by N. Arul Murugan, Chief Educational Officer, has exposed the hidden treasure. The rock murals, detected at three different sites atop the fort, appear to be the most ancient ones in Tamil Nadu. 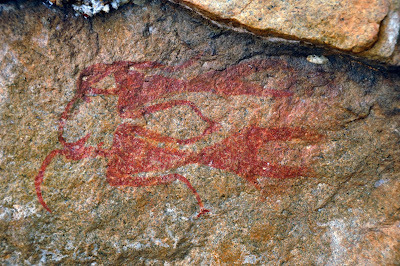 The paintings have been done on a rock surface. 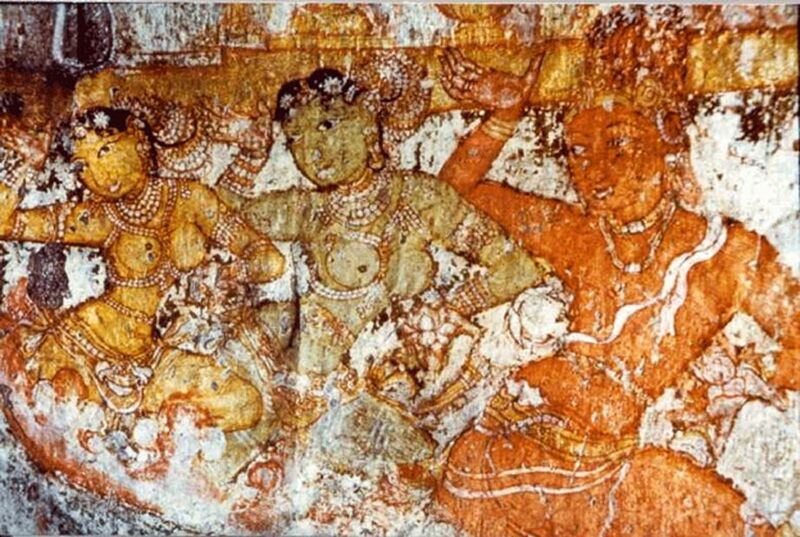 The rock murals could be older than the murals of Sithannavasal i.e., Pandyan era. One of the mural portray a man and a woman lying down in reclining posture.with their hands united. Some other mural art presents a dance program wherein a couple is engaged in playing percussion instruments and the row of men and women appear dancing on top. 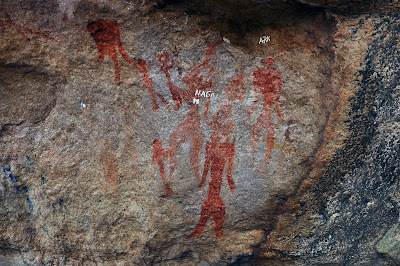 The history of art in ancient Tamil Nadu begins with prehistoric rock paintings. 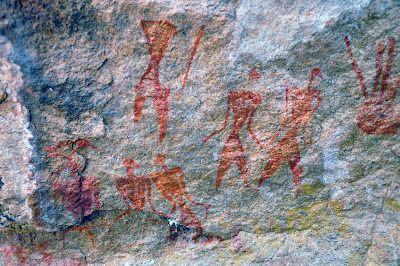 Scholars assign the date of the ancient rock murals around 5000 BC This kind of dance was mentioned in Tolkappiyam, ancient Tamil grammar work, as ‘Undattu’ (a dance). Koothu (Tamil: கூத்து) is the most ancient form of dance in Tamil land and is considered as the historical predecessor of the Bharatanatyam (பரதநாட்டியம்). Tolkappiyam (தொல்காப்பியம்) by Tolkappiyar (தொல்காப்பியர்), a book on phonology, grammar and poetics, assignable to the first century (pre-dates Bharata muni's Natyashastra, a grammar treatise on dance) provides information about the dance of ancient Tamils. Koothu is mentioned in Sangam poems like Kuruntokai (குறுந்தொகை) and Kalitogai (கலித்தொகை). Koothu was performed in honor of the young soldier who had fought valiant and returned victorious. A form of koothu was performed as a ritual to aggrieve the valiant death of the chief. Koothu was also performed for the Tamil god Murugan (முருகன்) and his tribal consort Valli (வள்ளி). This kind of koothu was performed with religious ecstasy. In ancient Sangam literature, the dance of Vettuvavari (வேட்டுவவரி) or Veriyattam (வெறியாட்டம்), a kind of koothu performed by women in a state of possession, has earned great reputation in connection with Murugan cult of Tamil Kurinji land. The koothu ritual accompanies the offering of food and drink (as well as animal sacrifice) before the Tamil god Murugan or Korravai (கொற்றவை). The dancers were priestess from Marava tribe. Sangam poems such as Kuruntokai (குறுந்தொகை), Akananuru (அகநானூறு), Paripatal (பரிபாடல்) and Narrinai (நற்றிணை) as well as Tirumurukarruppadai (திருமுருகாற்றுப்படை) have explanations and references about Vettuvavari or Veriyattam. Silappadikaram details ‘Kuravaikoothu,’ (குரவைக்கூத்து) (invokes the blessings of Lord Murugan by singing Kurinji-pann – ancient form of Tamil Raga), ‘Aaichiyar Kuravai’ (ஆய்சசியர் குரவை) (invokes the blessings of Lord Vishnu by singing Mullai-pann – ancient form of Tamil Raga) and ‘Kunrakuravai’ (குன்றக்குரவை) (in praise of Kannagi) have very rich information about ancient dance forms. 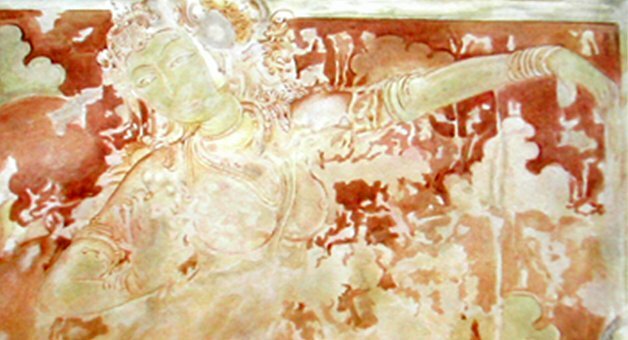 Thunangai Koothu (துணங்கைக் கூத்து) was focused on the martial arts and war. Tolkappiyam speaks of music and musical instruments at numerous places. Purananuru (புறநானூறு) lists out the music instruments used by Sangam society i.e., percussion instruments Muzhavu (முழவு), Murasu (முரசு), Thannumai (தண்ணுமை),parai (பறை); stringed instruments like yazh (யாழ்) lute, Thoombu (தூம்பு), Ellari (எல்லரி), Akuli (ஆகுளி), Kulir (குளிர்) and wind instrument Conch (சங்கு). Yazh was used as the primary instrument and accompanies with vocal music. Sangam poem Kalladam (கல்லாடம்) the 9th century poetical work by Kalladanar (கல்லாடனார்), refer various kinds of yazh (யாழ்) (lute): 1. Vil-yazh (வில்யாழ்) bow shaped instrument with 21 strings; Peri-yazh (பேரியாழ்) with 21 strings; Makara-yazh (மகரயாழ்) Capricorn shaped. between 17 - 19 strings; Cakota-yazh (சகோடயாழ்) with 16 strings; Kichaka-yazh (கீசக யாழ்) with 14 strings; Cenkotti-yazh (செங்கோட்டியாழ்) with 7 strings; and Chiri-yazh (சீறியாழ்) with 7 strings. The instrument lost its popularity when the Veena instrument emerged. Pann (பண்) (pentatonic scales associated with the five Tamil landscapes which could be viewed on par with present day raga.. example: Kurinji pann, Maruda pann, Palai pann, Vilari pann etc.) and palai (பாலை) (parental scale (தாய்ப்பண்கள்) - associated with the Melakartha). Ancient Tamils have defined the seven notes as Kural (குரல்), Tuttam (துத்தம்), Kaikkilai (கைக்கிளை), Uzhai (உழை), Ili (இளி), Vilari (விளரி) and Taaram (தாரம்). The string instrument Yazh was employed to define and categorize pann. Tolkappiyar employed the percussion instrument 'parai' (பறை) to define rhythm (தாளம்).. Starting from Agattiyam (அகத்தியம்) and Tolkappiyam, many texts like Indra Kaleeyam (இந்திரகாளியம்) of Yamalendra, Isai Nunakkam (இசை நுணுக்கம்) of Sikhandi, Pancha Marabu (பஞ்சமரபு) of Arivanar, Bharata Senapatiyam (பரதசேனாபதியம்) of Adivayilar, Kootta Nool (கூத்தநூல்) of Sathanar and Muruval (முறுவல்), Sayandam (சயந்தம்), Guna Nool (குணநூல்), Seyirriyam (செயிற்றியம்) -- whose authors not known-- have defined the grammar of classical dance and music. Kootha Nool, compiled by Sathanar, is an ancient treatise on dramaturgy which has nine chapters devoting to two different subjects ‘Suvai’ (சுவை ) and ‘Thogai.’ (தொகை). It focuses on tripartite arts of dance, music and drama. Scholars believe that this work formed the basis for Bharata’s Natyashastra. Pancha Marabu, a treatise on musical theory belonged to the third Sangam period. It lists out nine different divisions of Tamil music and deals with musical instruments including percussion instruments (Muzhavu). It also provides notes on hand gestures, abinayam, koothu, natyam etc., and prescribes the Jati syllables. Adiyarkku Nallar (அடியார்க்கு நல்லார்) in his commentary on Silappadikaram cites about Kootha Nool and Pancha Marapu. Bharatanatyam Darasuram. PC Ipseand ~ Welcome to My Playground! ‘Natyashastra’ (நாட்டியசாஸ்த்திரா) by the sage Bharatha Muni (பரதமுனி) sets the grammar for dance. Therefore it was being aptly termed as Bharatanatyam during 1940s. Earlier it was known as Chatir-attam. The date of Natyashastra and Bharatanatyam is not yet resolved. However scholars assign the date of Bharata Muni to Sangam period. Abhinav Bharati (10th century AD) of Abhinavgupta, commentary on Natya Shastra also known as Natya-Vedam, clearly brings out the basic concepts of the Natyashastra. 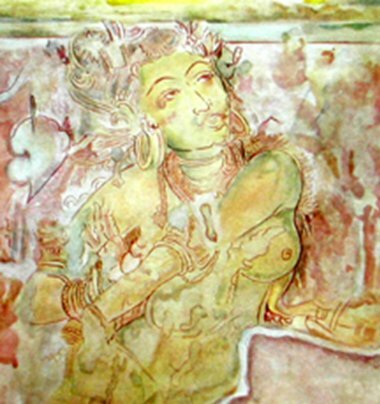 Sangita Ratnakara (13th century AD) of Sharangadeva focuses on the Natyashastra traditions including its desi variations. Nandikeshvara’s Abhinaya Dharpanam is an all-inclusive work universally adopted by most contemporary dancers and dance-masters. According to the Sangita Ratnakara, the Abhinaya Darpanam and other medieval treatises, the dance is divided into three distinct categories, i.e., Nrittam (pure dance), Nrityam (solo expressive dance) and Natyam (group dramatic dance). 108 Dance Postures. Chidambaram Temple PC Ipseand ~ Welcome to My Playground! Nrittam corresponds to pure dance steps performed rhythmically. It is the illustration of rhythm through graceful body movements. Here the movements of the body do not convey any mood or meaning and its purpose is the acute synchronization between rhythm and time, with dance movements. Nrityam corresponds to the mime performed to the poetic song. The dancer justifies the meaning of the song, through various bodily movements such as, facial expressions, hand and legs movements and abstract dance or Nrittam. Shuddha Nrittam was called Chokkam (சொக்கம்) in Tamil and all the 108 Karanas (கரணங்கள்) were performed in it. Chadir was the solo dance form performed for centuries by Devadasis in temples. Natyam corresponds to drama. Natyam means dramatic representation or drama with Speech, Music, Nrittam and Nrityam. Nrittam was given great importance in Tamil Natya. Kuravanji was the group dance by women, interpreting literary or poetic compositions typically on the theme of fulfillment of the love of a girl for her beloved. Bhagavata Melam was the group form of dance drama from Tamil Nadu, with all roles performed by men, and themes based on mythology. Few inscriptions exist in evidence to show that dance played an important part jn the life of ancient Tamils. 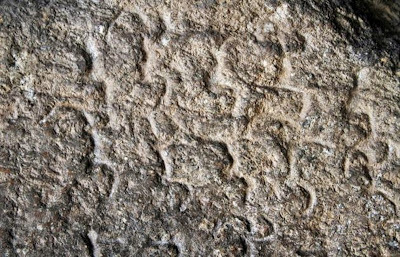 The ancient Isai Tamil inscription dating back to the second century BC was discovered in a cave on the western end of the hillock in Arachalur, Erode district. It is in Tamil Brahmi script. The inscriptions is related to Tala notes (Adavu) meant for a Bharatanatyam dancer. The tala notes is composed with five lines and as many rows, resembling a five-row - five-column matrix. The tala matrix has been arranged to enable the reader to read either from left to right or top to bottom it reads the same. It is a palindrome as well. Kudumiyanmalai music inscription is in Pallava Grantha script and the script resembles more or less with that of Pallava king Mahendra-varman (மகேந்திரவர்மன்). It is considered as important in the history of Indian music. This inscription is now extant between Bharata Muni's Natyashastra and Sarangadeva's Sangita Ratnakara. Yet another Pallava Grantha inscription in Kudumiyanmalai cave temple read as ‘Parivadinidaa’ (பரிவாதினிதா). Parivadini is by and large regarded as a seven stringed yazh instrument like harp type Vina (வீணை). The phrase ‘Parivadinidaa’ also forms part in few other rock cut cave inscriptions such as Tirumayam (திருமயம்) and Malaiyakkoil (மலையக்கோயில்).- both the rock cut caves are located - in Pudukkottai district. The inscription of Rajaraja Chola I dated 1004 AD on the outside of the north enclosure of Brihadisvara temple, Thanjavur (S.I.I Vol.2, Part 3 No. 65, 66) records the magnitude of Devadasi system. The inscription also makes reference about 400 dancing girls .imported from various Shiva and some Vaishnava temples in Chola territory and settled in the neighborhood of the Brihadisvara temple. The inscription also informs about the host of temple staff including dance-masters, musicians, drummers, singers etc., Brihadisvara temple, Thanjavur also hosts a circular platform known as 'Kuravanji Medai' for dancers to perform. The Devadasi dancers have performed the Rajaraja Natakam, depicting the history of temple construction. 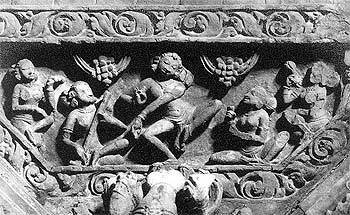 Few medieval inscriptions cite to the tradition of staging koothus in temple dancing halls. An inscription of Rajendra Chola (ARE 1914 No. 65) records the gift of land by the general assembly of Kamaravalli Chaturvedimangalam (காமரவல்லி சதுர்வேதிமங்கலம்) to Sakkai Marayan of Vikramasolan for performing Sakkai Koothu (சாக்கைக் கூத்து) thrice on each of the festivals Margali Tiruvadirai (மார்கழி திருவாதிரை) and Vaikasi Tiruvadirai (வைகாசி திருவாதிரை). Yet another inscription (ARE 1914 No. 254) registers the grants made to a shrine of Sadiruvidanga nayakar (சதிருவிடங்க நாயகர்) set up by Kulottungasola Kidarattaraiyan for performing Sandi-koothu (சந்திக் கூத்து) during the Tiruvadirai festival that falls in the month of Vaikasi. Another inscription (ARE 1921 No.42) in Kanchipuram registers about the performance of koothu by the troupe artists at Kanchipuram and other places. The koothu tradition flourished under the patronage of temple institution since the time of Silappadikaram. 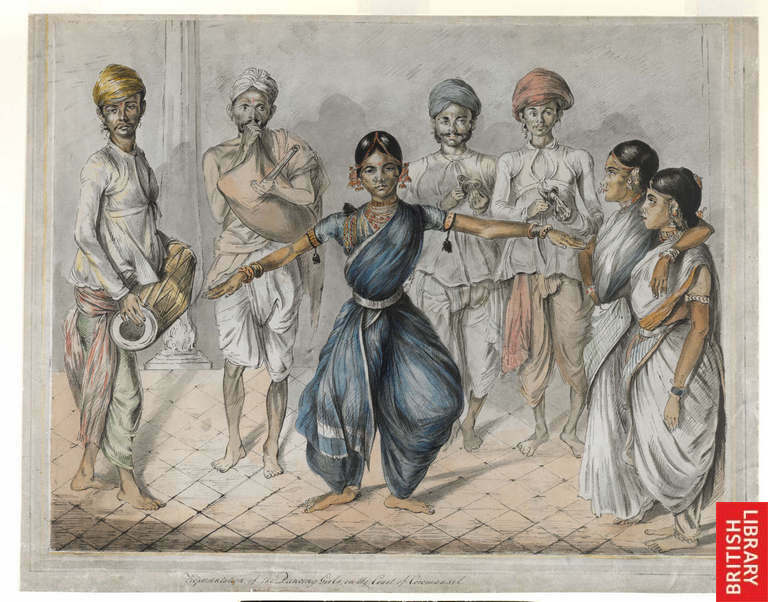 Later dance in the temple as a ritual was performed by the specially trained ‘Devadasis’ or the “Servants of god.’ Devadasis were young girls who were dedicated to the temple and were married to the god in a ritual. Devadasis attached to Shiva temple were known as 'Rishabathaliyalar' and those attached to Vishnu temple were named as 'Sri Vaishnava-manickam'. They were not allowed a regular family life but were highly trained in dance and music. Temple gave them housing, land and regular income. Ilango Adigal Silappadikaram. Translated by S.Krishnamoorthy. Bharathi Puthakalayam, 2011. 176 p.